Books to Dream: The Curious Incident of the Dog in the Night-time: Review! The Curious Incident of the Dog in the Night-time: Review! 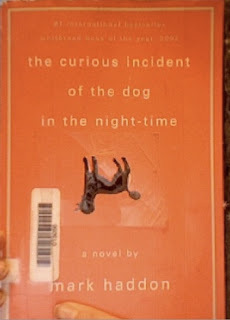 As I have mentioned before in a few of my previous posts, I have decided to do a special review on the Curious Incident of the Dog in the Night-Time by Mark Haddon. This review will not only talk about my thoughts on the novel, but also analyze and respond to Ali's thoughts from Loving Life by Reading. If you would like to see a summary for this novel, check on Goodreads, it provides great synopsis's for every book. The Curious Incident of the Dog in the Night-time is an extremely thought-provoking novel that provides a shockingly different view into an outsider's life. In Ali's review, she talks about the way the novel was written provides "a window into Christopher's mind". I also felt like the book acted as an amazing insight, such as the descriptions of how his mind is like a film: he can replay, fast forward, and rewind his memories (pg. 76). He also sees the world in extraordinary detail, making life confusing for him (pg. 140), which helped to develop his character and make sure he was a round character. I also agree with Ali about the format the book, and how the journal entries allow you to understand Christopher and also make the book a quick read, which was nice for a change. Ali mentioned in her review that “It is an easy read”, but it would be helpful if she explained that, because I disagree. Some of the material covered is pretty heavy and sometimes it’s hard to put yourself in Christopher’s shoes. Ali’s recommendation was 12+, though I would say no one under 13 because there was serious subject matter, quite a lot of swearing, and it could get confusing for younger readers. An original novel for sure, the Curious Incident of the Dog in the Night-time was certainly an experience to read. I often felt uncomfortable while reading, most likely because it was far out of my comfort zone of fantasy and science fiction, and also because of the way Christopher was treated. It also was difficult to understand sometimes, such as his discussion of how the cars he sees in the morning will determine if he has a good or bad day. However, I felt that the visuals really added to the story. It often helped me to understand the way that Christopher thinks and also broke up the text. I especially liked the pictures of emoticon faces to describe which emotions he couldn't understand. Because we are in Christopher's head, the author can't explain that Christopher doesn't understand the "angry" face. This leads me to the theme, which is learning to see life through someone else's eyes. I think Haddon chose to write this book to convey the way that different types of people think, through an engaging method. Overall, I gave the novel 4 /5 stars because the plot was a bit sporadic because the transitions were often rocky, and it was lacking in the mystery elements. However, it was a very enlightening read that encouraged me to think out of the box.